This is going to be a rave review. I like Julie Zickefoose’s art, her writing, her blog, her blog posts here on 10,000 Birds, and, of course, I like birds. 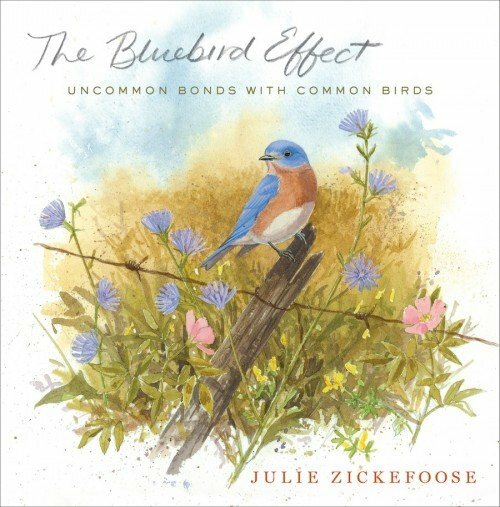 So a book about birds by Julie Zickefoose, featuring her writing and art, some of which has been featured in different forms on her blog, is guaranteed to be a hit with me. How could it not be? And The Bluebird Effect: Uncommon Bonds With Common Birds not only lived up to the great expectations that I had for it but greatly exceeded them. First of all, the 384-page book is beautiful from hardcover to hardcover, literally. The Eastern Bluebird on a fence post surrounded by wildflowers on the front cover is great but I like the Ruby-throated Hummingbird perched on a clothesline, dwarfed by clothespins, that graces the back cover even more. The book is loaded with Julie’s art from rough sketches, often helpfully captioned in Julie’s own handwriting, to full-color, full-page reproductions of her wonderful watercolors. I love her Carolina Wrens, her Piping Plovers, her Chimney Swifts, her Ivory-billed Woodpeckers, and her Phoebes, both avian and human. You might be forgiven for thinking that a book so richly illustrated could not possibly have prose to match but Julie managed to do it. It is her willingness to share personal moments in a way that is not self-aggrandizing or egotistical that is perhaps what makes Julie’s writing so accessible. You don’t forget that Julie is a mother, a wife, a daughter. But her family’s appearances throughout the twenty-five different chapters of the book are as natural as the descriptions of how she managed to get the nestling Chimney Swifts to eat or the decline of a long-lived Orchard Oriole. Julies does not compartmentalize her life, she lives it, and this book is a reflection of that, which might help explain why I like the back-cover image of the hummingbird on the clothesline so much. But even as she lives her exceedingly busy life the gears in her head are turning and she is thinking deeply about the topics about which she writes. The work of a nature writer, particularly one writing about individual birds, is tricky. You can’t be overly anthropomorphic or write too clinically because either approach will turn off one audience or another. Julie manages the high wire act of recognizing that the birds are neither mindless automatons nor little people. I always thought I could detect a bit of Bernd Heinrich’s influences in Julie’s writings, though she manages to avoid the sometimes overly technical digressions on which Heinrich has a tendency to go off, and I was pleased to see my suspicions were correct as she names him, among several others, as an author of nature books that she counts among her favorites. Like Heinrich, Julie shares not only the stories that she wants to tell but also the thought processes that she went through to come to her conclusions. Her writing is the richer for it because you feel like you are going along on a ride in Julie’s mind and by the time she has figured out where she stands on an issue you are likely to be there standing next to her. Even if you aren’t in the exact same place you can understand and appreciate how she got to where she is. This style of writing is most evident in her two pieces that grapple with issues around hunting, her writing about the Ivory-billed Woodpecker, and her moving and marvelous chapter about Charlie, the irascible Chestnut-fronted Macaw that she lived with for twenty-three years. I count Julie as a friend and a role model. Her willingness to forge her own path, professionally and personally, is an inspiration to many, and I highly recommend that you go out and get a copy. Your heart and mind will be the richer for it. So uncool to have been refreshing the 10,000 Birds homepage twenty times this morning, and to be the first to comment. I don’t care. I never aspired to be cool. Wiping tears. Thank you, Corey, for getting what I do so thoroughly and deeply. And Houghton Mifflin Harcourt needs to take a bow for realizing it all in print with such care and quality. The days of print books may be numbered. I’ll plod out with them. Thank you, again. I promise to write something groovy for 10,000 Birds soon! So with you, Corey. I’ve been a fan of Julie’s for years, when I would get a copy of Bird Watcher’s Digest and immediately flip to the index in hopes what she wrote something that month. (not a problem any more…she has a regular column now…True Nature it is called.) Due to $$$ matters, I only get one bird magazine now, when I used to get them all. I can’t give up Bird Watcher’s Digest, because I want to see what Julie wrote! And then, it dawned on me…her name was on some of the painting too!!?? To this day I cannot grasp that so much talent can me wrapped up inside one amazing woman. No fair! But we are all blessed to be exposed to what Julie can do….and so blessed she is so willing to share her world with us all. This is such a fantastic review. Makes me even gladder that we ordered the book last night. Can’t wait to read it. I especially like this line in your review, Corey, “Julie manages the high wire act of recognizing that the birds are neither mindless automatons nor little people.” Quite a feat, and my own aspiration! Count me among the many. Great review, Corey. I think you put into words even better than I could why I love Julie’s writing so much. Wonderful review…if I hadn’t already ordered it, I’d order it again. Other readers…don’t hesitate to order this book no matter where you live. Julie will work with you to ensure you get the book.